The farm animals have escaped! It's your job to round them all up, but you are in luck, because all of your neighbors are trying to gather them up too! 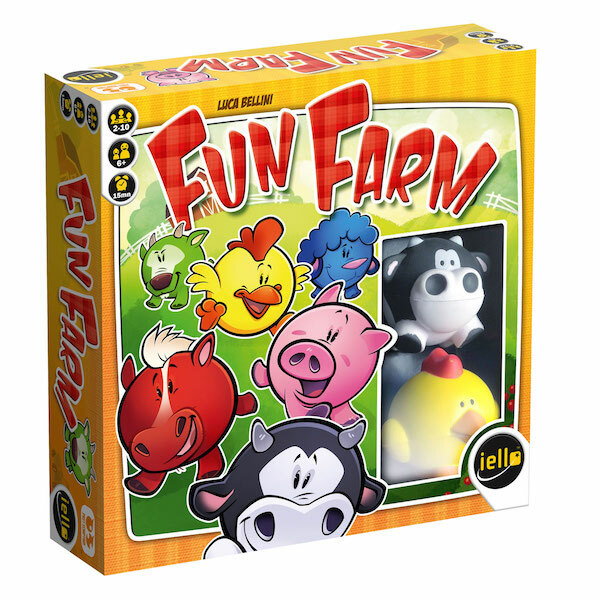 You'll need fast hands and sharp eyes to grab the most animals and win the game! In this fast-grabbing game, players compete to spot and catch the animal shown on the revealed cards before their opponents. Each round, the active player reveals the top card from the deck, placing it next to any others still on the table. Each card depicts an animal, a color for the black die, and one for the white die. The player then rolls both dice. If the color rolled on a die matches the one depicted for the same die on one of the face-up cards, players race to grab the depicted animal from the table.Whoever does so first claims the card, and once the deck runs out, whoever has the most cards wins! But if none of the cards are claimed, another one is revealed, adding to the cards already visible. Sometimes multiple animals have to be grabbed at the same time. The same player can even try to grab 2 (or more!) animals at the same time!